Folly Cottage01263 715779work01603 870304fax Self-cateringThis late 19th Century flint and brick cottage maintains a traditional exterior but is equipped with comfortable furniture, tastefully decorated and has modern utilities allowing guests to make the most of their stay in this beautiful area of Norfolk. There are many walks to tread in the local radius, including coastal paths, nature trails and other routes to explore. This property is perfect for groups and families wishing to relax in the countryside and breathe the fresh air. • Other: Bed linen and towels, Starter pack of fuel for woodburner, Books and games provided. WiFi. Please note: Pond is not covered so children should be supervised and traffic noise is audible in the garden. • Accommodation limited to 4 including infants. 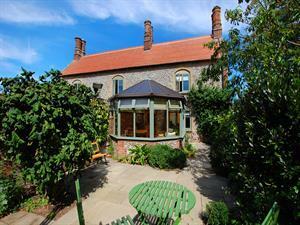 Pretty brick and flint cottage.